Among the trailing vines that wrapped themselves around and around the old rusted fence, moved a small creature. It’s eighteen feet moving forward inch by inch. Stiff black bristles shone in the sunlight that beamed from a cloudless sky. It had bright red markings on it’s back that showed when ever it moved across the leaves, or curled into a defensive position. The creature was a Giant Leopard Moth Caterpillar. I was able to keep the caterpillar for a week before it started to “spin” its cocoon. It was neat to watch it slowly weave strand after strand of golden colored “thread” that came from an area near its mouth. It continued to weave until it had imprisoned itself with in the web. It had never done it before and yet it did it with ease like an expert. :) Even seemingly “little” things like the life cycle of an Moth or Butterfly are awesome testaments to our great, wise all-powerful God. 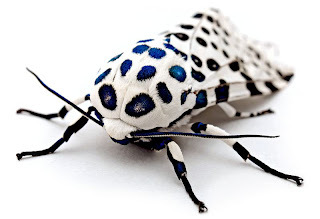 I found this beautiful photo of an adult Giant Leopard Moth on the Wikipedia website. Disappointingly, unknown to me, the caterpillar had become a host for a parasitic fly, which apparently had laid its eggs on or in the caterpillar before I got it. They hatched at this point and killed it. While doing some research online regarding parasitic flies I found that they, for the most part, are helpful insects. They are designed for a purpose to help control harmful insects. It was disappointing to have the Giant Leopard Moth caterpillar die, but on the other hand, it was a new learning experience as I had never came in contact with something like it before. All of God’s creatures serve some purpose, and even the flies are evidence of God’s amazing design. Thank you for sharing this, Emily! It was a very interesting (and insightful!) read. The moth is simply stunning . . . yes, indeed, what an amazing Creator we serve! That is so neat! The moth is really pretty! Thanks for sharing this, Emily! Just a moment ago, I found the Giant Leopard Moth Caterpillar on my back patio. I carefully let it cling to a pencil and scooped it onto a book to return it to the butterfly bushes I grow in my yard. He was gorgeous. I wasn't quite sure what he was until I looked him up online. The funny thing is I also found the full grown leopard moth in June of "06, the same week that my mother passed away. Still not knowing what he was, I can say for certainty, it looked exactly like the picture you posted. Since then and even more at this moment, I always thought it was a sign from above, the lord letting me know that my mother, who was crippled with M.S. 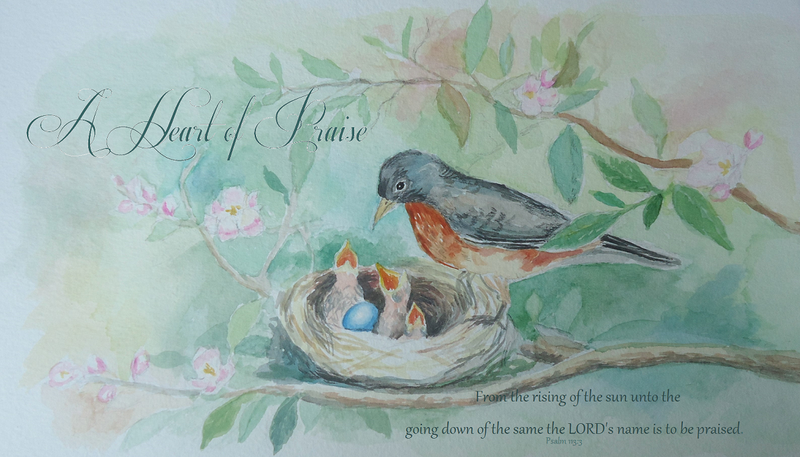 here on earth was now in our lords hands and he was releasing her from disease and letting her fly. With that said, I couldn't have been happier to read your comments about the beautiful moth and how our lord takes care all creatures. I may sound sound crazy but I feel he's taken care of the sadness I feel of my mom's passing by showing me this little creature and reaffirming my faith that he will makes us new again when we meet in heaven. The lord takes care of all. i have had one of these caterpillars for a few months and he came out of his cocoon today. i wasn't sure until a few minutes ago what kind of caterpillar he was. he's really pretty. can you tell me what he eats? i am planning on keeping him until it warms up outside. We just found a caterpillar like this. My children are so excited! Thank you for sharing your story. I think we are going to try to make a habitat for this creature. We would love to see it turn into that amazing moth. Found one of those last night when I was getting ready to feed my dog and decided to smash the darn thing with my foot!.................Just kidding, it's April's fools. No I scooped the thing on a piece of paper and took it in my garage, didn't know what kind of caterpillar it was and wasn't about to grab it. Did put my magnifying glass to take a better look at it, then took a couple of pictures and released it in a safe place. This is my 1st time to your site. My thanks also for the info on the Giant Leopard Moth! I live in Austin, Texas and we have had the hottest summer on record so far, with double digit days over 100 degrees (one day it was 110!) In all of this heat I have seen no less than 25 of the Giant Leopard Moth larvae. You can see them on the streets/roads. There's a lot of buzz, but no clear and concise info like you have laid out. The pictures were of great help! And, now I know which plants to net so they are not eaten. Yeah! I am truly grateful for you today. Being guided to your site is a God thing (as we say). How simply magical He made our world. I am doing a placement in a kindergarten and we have made a black fuzzy caterpillar as a class pet and have named him "Coco":) Yesterday we saw Coco in two pieces and it wasn't moving but when I poked it gently with a Kleenex, one piece started to move, is it normal occurrence? Can anyone tell me when they should be released. My first leopard moth was a female and it was summer when she hatched so I figured the other moths were out so I released her. Today a boy was hatched and its kinda cold out. So I'm thinking its not a good time to let him go. Anyone?